An NGO in Belarus launches a website to help the citizens to analyse information on public procurement and identify possible corruption schemes. 700 projects submitted for contest of local initiatives implemented by EU/UNDP. Living Library celebrates one year of existence. During this time, the team of "librarians" visited different Belarusian cities and gathered 200 people at a time. 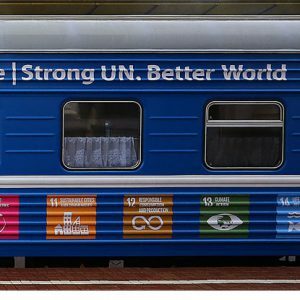 The UN in Belarus travelled around Belarus by a special train UN70 Belarus Express. Green Network invited Minskers to exchange wastepaper for seedlings. Website will look for corruption. SYMPA launches a website Opentenders.by, which will help the citizens to analyse information on public procurement and identify possible corruption schemes. The platform collects information on public procurement on all public sources. It allows to use filters to search what company wins in a tender, what tenders are carried out by a specific contractor and so on. After the introduction of more complex algorithms it will be possible to detect the specific corruption schemes. Action PahoniaPobach starts in social networks. Civil activists want to support the cadets of Yastrabelsk College who photographed in Pahonia T-Shirts. The cadets have been expelled from college, unofficial sources report. A published photograph became viral on social networks and appeared on the media – people post their own photos with the Pahonia symbol and describe their attitude to it. Pahonia is a Belarusian historical coat of arms; in 1995, Alexander Lukashenka scrapped the Pahonia's status as the official coat of arms and replaced it with a modified Soviet emblem. Living Library celebrates one year of existence. During this time, the team of "librarians" visited different Belarusian cities and gathered 200 people at a time. The idea, which comes from Denmark, is simple – to bring people in the same space where "books" (people that represent some stereotypes) tell their stories to "readers" who want to get rid of stereotypes. The "books" include representatives of different religions, nationalities, professions, LGBT community, etc. 700 projects submitted for contest of local initiatives. Belarus is currently implementing the UNDP/EU joint project Support to Local Development through 2017 aimed at developing a strategy for regional development and involving the public in the process. The project financing is estimated at €5 million from the EU budget. The recent contest of local initiatives received applications from more than 700 organisations, executive committees, and residents. Global Entrepreneurship Week (GEW) is to take place in Belarus on 16-22 November. Topic of 2015 is Unleashing Opportunities In Times of Change. All GEW activities and events are aimed at enabling people to investigate their innovative potential, and to turn ideas into reality. Since 2011 Belarus has become one of 137 countries participating in the largest entrepreneurial initiative around the world. GEW activities in Belarus are coordinated by Bel.Biz company and attended by more than 2,000 people. Online course on public administration. School of Young Managers in Public Administration (SYMPA) together with the Department of Social and Political Sciences, EHU, announces a call for participants for online course Public Administration and Public Policy: Current Practise and Transformation. Classes are held in the system of distance learning Moodle. Course duration is 12 weeks. Deadline for applications is 9 November. Flying University continues open lectures in November. Weekly, on Wednesdays, Flying University organises meetings with Belarusian intellectuals, scientists, and cultural figures to reflect on a variety of humanitarian, social and cultural issues. Among the speakers are Uladzimir Matskevich, Ales Smalenchuk, Ihar Babkou, Tatiana Vadalazhskaya, Ales Razanau, Vyachaslav Babrovich, etc. Platform Talaka.by announces a call for Project Consultant course. The program is open for participants who want to improve their skills in project management and help others to effectively plan projects. Project Consultant is a unique course, developed by Talaka.by team. It is based on the experience of 190 projects posted on the platform, 40 of which have been successfully implemented. Education is free. Applications are accepted until 16 November. Student Week. On 9-17 November Minsk will host the festival Student Week dedicated to the International Day of Solidarity of Students. The festival is held in Belarus for the second time, and includes discussions, seminars, city game, movie night, concert, etc. Among the organisers are several youth CSOs – Studentskaya Rada/Student Council, ZBS/Association of Belarusian Students, Brotherhood of Organisers of Student Self-Government (BOSS), etc. Green Network invited Minskers to exchange wastepaper for seedlings. In October the World Paper Free Day, the residents of Minsk in exchange for waste paper could get saplings of maple, oak, nuts, and learn about different ways of economical use of paper. On this day people all over the world came together to share experiences of reducing wasteful consumption of paper and carry out actions in support. Centre for Urban Initiatives announces the launch of a School of Urban Initiatives Greenhouse.Greenhouse is a series of meetings and lectures in Mogilev that are to help citizens become more initiative and active participants to improve life in the city. During the course, fellows will develop their projects to improve urban life; the most interesting of them will be supported. On 27 October, the Belarusian statistical office released revised GDP data. The government actually bets on a quick revival of the economy and bails-out some firms and industries through expanding its own debt. However, this in turn creates a potential problem of public debt sustainability, as the perspectives for creating the effective economic activity of firms under a bail-out look doubtful. Another troubling trend is that the growth rate of outstanding loans has been significantly higher than the expansion of firms’ economic activity​. ​The Belarusian statistical office reported that in January-September GDP contracted by 3.7%. From the perspective of recession, this figure provides ambiguous signals. On the one hand, the deepness of the recession was less than in January-July. On the other one hand, GDP performance in September deteriorated in comparison to August. Some swings in output dynamics occurred due to late harvesting this year. If this fact is taken into account, the perception that the bottom of the recession is further ahead becomes more reasonable. New statistics show further that Belarus is experiencing a significant shock in its level of potential GDP. The latter emphasises the partial disorganisation of the important aspects of the national economy, which might increase the length of the recession, which will result in lower living standards. ​The Belarusian authorities prefer to accuse external shocks for the poor GDP performance. For instance, the first deputy Minister of the Economy characterised the current trends as 'adaptation to a new normality’. Although external shocks have indeed become a trigger for the recession, currently mainly domestic adjustments speed up and increase the contagion of recession. However, problems associated with poor GDP performance and lower living standards have both lost their top positions in the economic agenda for now. This is due to the Belarusian authorities announcing the new denomination in 1 July 2016. Although the technical step of removing 4 zeros from prices will not have any effect on economic dynamics, it has attracted much public attention. Belstat reports that the ‘average’ financial stance of firms improved in comparison to previous years. For instance, the average level of sales profitability in January-August 2015 improved modestly in comparison to previous year, although it remains close to the historical minimum. The improvement in profitability became possible mainly due to cost adjustments, as most firms currently face much tighter budget constraints. However, each firm’s performance is not uniform. The share of loss-makers increased threefold in 2015. The absolute amount of loss generated by these firms during the first 8 months of 2015 approached to roughly 5.5% of GDP. Within the real economy a divide among firms has arisen. Some firms appear to be successful in adjusting to the new environment, due to lower costs and growing productivity. Yet other suffer and for them operating in a recession environment results in progressive loss-making and debt accumulation (see Table 1). From this perspective, wood-working manufacturing has become a good example. In 2007-2014, the government initiated a so-called modernization of the industry, allocated to the industry more than $1 billion through a mechanism of direct lending. 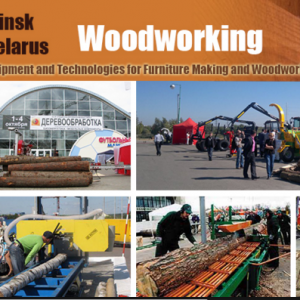 During a meeting between government officials and Alexander Lukashenka in late October devoted to wood-working, the officials recognised that majority of wood-working firms will not become profitable in the near future. Moreover, a huge amount of debt has been accumulated by these firms (during the modernization campaign) and so it becomes further each firms poor prospects. This in turn becomes a huge challenge for the banking system of the country. In the case of wood-working, Lukashenka decided that the government should purchase this debt from commercial banks. This scheme looks pretty similar to the one employed in June for supporting state machinery firms. The government in turn is forced clean each banks’ balance sheets from the issue of potentially bad loans by means of increasing government debt. Over roughly a decade, the growth rate of outstanding loans has been significantly higher than the expansion of firms’ economic activity. Hence, the fraction of each firms own capital has decreased constantly. Between 2004 and 2014 it fell by 22.1 percentage points down to 57.3%. instigating loss-making activities, expecting that either the interest rate will go down, or the demand will revive in the short-term. A significant number of firms (especially state-owned ones) had to select the third option, as ceasing/contracting production would have meant a quick default on already accumulated debts. These threats have also emerged in banking balance sheets. The share on non-performing loans started growing, although modestly (see Figure 1). But one may argue that the problem is gaining momentum. For instance, the growth rate of assets classified as ‘in between standard and non-performing ones’ (i.e. the part of these loans will become non-performing soon) is growing rapidly. The deteriorating financial performance of firms has already affected banks’ financial results. Due to the deteriorating quality of assets, nearly all the banks display lower profitability in 2015 in comparison to previous year. More than this, some banks have displayed losses in the last quarter of 2015. From this perspective, a long drawn out recession might hit the banks further (individually, or, in the worst case, systemically), thus continuing the feeling of depression in the economy.